Presented with identical 1080p/VC-1 transfers on HD DVD and Blu-ray, this remastered release of '2001: A Space Odyssey' features a revelatory upgrade in picture quality that's likely to leave fans buzzing with excitement. Colors are magnificent, rich, and stable from beginning to end -- skintones are perfectly saturated and primary hues are bold and vibrant. Blues and reds receive the most noticeable improvement from past DVD editions, but the entire palette is striking. I'm also happy to report that contrast is dead-on, black levels are inky, and shadow delineation reveals a variety of elements formerly cloaked in darkness. The print is in excellent condition and isn't marred by softness, edge enhancement, scratches, or any distracting instances of source noise. There isn't a hint of the blockiness that haunts 'A Clockwork Orange' and the transfer easily surpasses the new 2-disc Special Edition DVD (as well as every other previous home video release of the film). As I watched this HD DVD, I searched for something to complain about, but I'm happy to report that I failed to find a single thing. 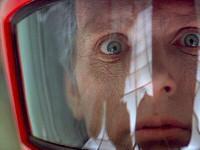 '2001: A Space Odyssey' has set a new bar for catalog transfers in high definition. For a film that's nearly forty years old, this high-def release is nothing short of a godsend. 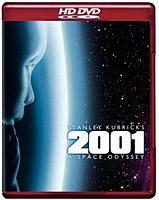 This HD DVD edition of '2001: A Space Odyssey' features a Dolby TrueHD surround track (48 kHz/24-Bit/3.0 Mbps) and a standard Dolby Digital Plus 5.1 Mix (640 kbps). While I didn't notice much of a difference between the two tracks, both sound better than ever and provide a a faithful experience that still manages to enhance Kubrick's original vision. Porting over the entire array of extras that appear on the concurrently-released 2-disc Special Edition DVD, this HD DVD edition of '2001: A Space Odyssey' is a veritable cornucopia of supplemental content. It may not give purists the "absolute" experience they were hoping for (many were praying for a technical commentary or a track that contained a critical dissection of the film), but it's hard to imagine any fan being truly disappointed. 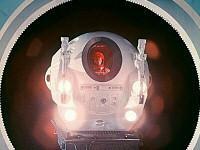 Admittedly, '2001: A Space Odyssey' isn't for everyone -- but in my opinion it's the single most important science fiction film in the history of cinema. It has influenced film as we know it and deserves all of the clout and recognition that can be heaped on its silent shoulders. Likewise, this HD DVD edition is a must-have release, featuring a jaw-droppingly gorgeous transfer, an elaborate TrueHD audio track, and a wealth of supplemental features. It's an upgrade in every sense of the word and may just be the easiest twenty dollars I'll ever spend.